El Hombre has yet to run a bad race in three starts at Newcastle and he can keep up that good run in the Betway Live Casino Handicap. 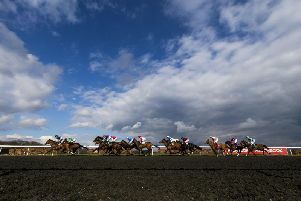 One win, a fourth and a third last time out show how much Keith Dalgleish’s charge enjoys the Gosforth Park surface and that recent placed effort was probably also something of a relief after a lacklustre 2018 so far. El Hombre has been tried in some pretty hot races this year, not least the Portland at Doncaster and the Ayr Silver Cup, but a drop in class seemingly put him back on the right lines last week. Beaten just over a length by Outrage, El Hombre did not find the necessary room to really make his presence felt at the finish and can surely be rated a shade better than the bare form suggests. Matterhorn has won one of his two outings so far and can continue in that vein in the Follow Sun Racing On Twitter Novice Stakes. He impressed in a fairly moderate maiden last time and looks as though a step up from this mile trip will suit in due course. Corelli is a fascinating contender for John Gosden in the Betway EBF Buccaneer Conditions Stakes at Southwell. He was last seen when finishing a distant third in the Lingfield Derby Trial back in May, with winner Knight To Behold having gone on to score at Group Two level while the runner up was St Leger hero Kew Gardens. Corelli was beaten a fair way that day and it is notable that Gosden chooses now to pitch the Point Of Entry colt back into action. Sam Spinner was one of the feel-good stories of last season as he graduated to Grade One level for Jedd O’Keeffe and hopes are high he can kick off this campaign on a winning note at Newbury. The six-year-old made every yard in the Long Walk Hurdle at Ascot last December, and that victory was enough to see him sent off as favourite for the Stayers’ Hurdle at Cheltenham. He possibly did not stretch his rivals enough when finishing sixth, while he never looked like putting his best foot forward on his subsequent run at Aintree when taken on for the lead. Refreshed after a summer break, he certainly faces a decent test in the Ladbrokes Long Distance Hurdle, but if he is to make his mark in the staying division again this term, he should be thereabouts in this Grade Two heat. Santini is likely to be a short-priced favourite for the Ladbrokes Novices’ Chase. Nicky Henderson’s charge won three of his four novice hurdle outings in the 2017/18 campaign, with his only blip coming when third in the Albert Bartlett at the Cheltenham Festival. The six-year-old was an impressive winner on his only point to point start, so the omens are obviously good as he starts out in the chase sphere. Aux Ptits Soins might be worth a tiny interest as he returns from a long lay off in the Ladbrokes Handicap Hurdle. Now with Dan Skelton, the eight-year-old was good enough to win a Coral Cup on his first British start three years ago but has had his problems since. 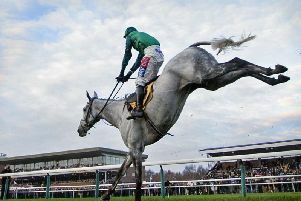 Tommy Silver paid the price for an inconsistent round of jumping when only second on his most recent outing but can right the record in the Eden Farm Hulley’s Handicap Chase at Doncaster. DONCASTER: 12.00 Windsor Avenue, 12.35 Real Warrior, 1.10 Roses Poses, 1.45 Tommy Silver, 2.15 Amanto, 2.50 Scooby, 3.25 Getaway Mission. DUNDALK: 6.00 Calling Time, 6.30 Major Power, 7.00 Kodiac Pride, 7.30 Fighting Flame, 8.00 Clare Island, 8.30 Too Precious, 9.00 Stealth. LIMERICK: 12.15 Tibetan Gold, 12.50 Drifting Back, 1.25 Bay Hill, 1.55 Lleyton, 2.30 Whatsinthecorner, 3.05 Sir Ector, 3.40 Arion Sky. NEWBURY: 12.10 Encore Champs, 12.45 Delire D’Estruval, 1.20 Allart, 1.50 Santini, 2.25 Touch Kick, 3.00 Sam Spinner, 3.35 Aux Ptits Soins. NEWCASTLE: 5.15 Waitaki, 5.45 Bataar, 6.15 EL HOMBRE (NAP), 6.45 Klipperty Klopp, 7.15 Assimile, 7.45 Matterhorn, 8.15 Tidal Surge, 8.45 Kroy. SOUTHWELL: 11.20 Star Cracker, 11.50 Give Em A Clump, 12.25 Epitaph, 1.00 Corelli, 1.30 Huntsmans Close, 2.05 Bold Spirit, 2.40 Mr Coco Bean, 3.15 Boots And Spurs.